Cedar Creek Corrections Center opened in 1954 and is a minimum security prison. This facility has a capacity of 480 male offenders and houses them in two units; Cascade Unit and Olympic Unit. Inmates at Cedar Creek Corrections Center provide service crews that provide labor for government agencies and non-profit organizations. Some of the work performed by inmates includes operating a wastewater treatment plant and maintenance at Washington Corrections Center. Offenders also work maintaining trails, planting trees, and fighting forest fires for the Washington Department of Natural Resources. Cedar Creek Corrections Center allows some inmates to work with animals. Inmates are taught how to train service dogs and are paired with a canine for several months while the animal undergoes training. This program is provided through Brigadoon Service Dogs. Offenders at Cedar Creek Corrections Center are provided anger and stress management counseling, an intensive out patient substance abuse program, moral reconation therapy, and cognitive behavioral treatment. Inmates can work institutional jobs providing support services to the prison in custodial maintenance, laundry, and food preparation. Technical training is available in siding, roofing, drywall installation, and building maintenance. 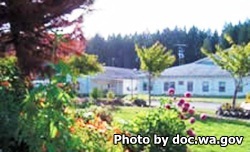 Visitation at Cedar Creek Corrections Center utilizes a rotating schedule according to the inmate's housing location. You can view the current visiting schedule here in .pdf format. Additionally, you should read the departments memo on visitor check-in here.